All our software is designed and implemented by means of advanced technologies and Open Source software. The Administration Software offers a flexible and intuitive computer platform that represents an evolution in the previous operational logic merely based on the Users’ order of arrival for the management of User access to the various services. It is based on a LINUX Operating System and Open Source components and uses the most advanced WEB programming methods, all of which makes it able to work both autonomously, through the Server installed on the Booking Unit, and with a local or remote external database leading to the centralised management (even via Cloud) of offices located in different geographic areas. Our Software guarantees different access levels (Office User / Configuration / Monitoring) on the basis of the safety credentials entered when accessing the webpage, which is performed via the Browser installed on any PC connected to the Internet. There are different configurations available based on the features the Operator is allowed to activate (counter stop, ticket stop, sending an User to another queue, call modes setting between different queues, management of the booking list similar to that of a doctor’s office etc.). 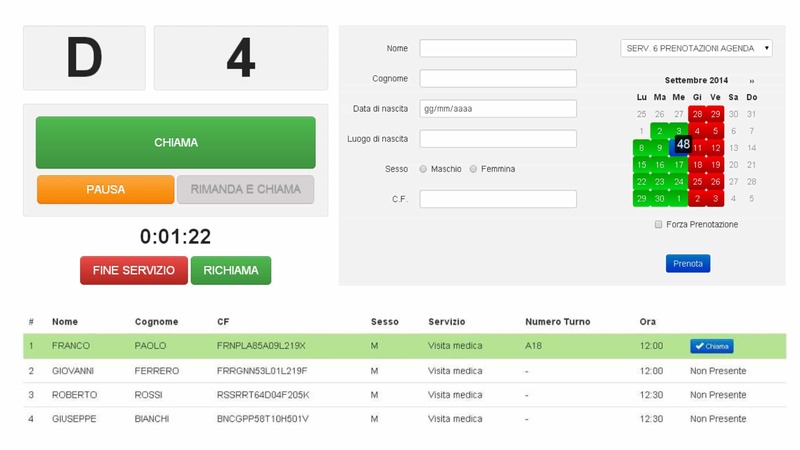 The system provides web access via any browser, provided that the monitoring credentials are entered, and offers very intuitive tools for real-time display of active counters and services, the queue’s situation and the monitoring of configured limits, so as to obtain real-time optimisation of the service level based on the available resources. The System administration in possession of the configuration credentials is granted access so that the configuration of Booking Units, Monitors, Services, Counters and Authorised Users can be modified. It is also possible to access statistical data in order to consult and export it. Our IT Technicians in charge of the software’s implementation are also at your disposal to analyse any request and suggest the best solution from an economic and organizational point of view. The Users who download the TEOM WebSI Application on their Smartphone or Tablet can find the nearest office where they can book a ticket and acquire information on the available Services and the queue’s situation. This APP is hosted on TEOM Servers and allows everyone to access any System nationwide; it does not just “issue an electronic ticket”, but rather monitors the User’s arrival at the office (i.e. when the ticket is printed on paper) and allows the Operator to call him/her.